The Saint-Petersburg Submariners' Club (SPSC) was created in the end of November of 1994 on the initiative of several retired submariners of the 3rd Submarine Flotilla of the Northern Fleet as independent, nonprofit, voluntary society. The main purpose of the Club was to provide social assistance to active and retired naval officers and their families. For the ten years the Club has become a real international body and extended it's goals and fields of activities. At present, the club has more than 2000 members from Russia, all of the former USSR republics and 25 foreign countries. The Club conducts regular meetings of Russian and foreign submariners and consults all those who are interested in the history of the Navy - from students to writers, researchers and teachers. The Saint-Petersburg submariners took part in creation of several documentary and feature films such as "Hostile Waters", "K-19 The Widowmaker", and others. 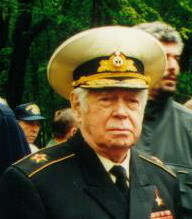 In 2000 the Club was the main organizer of the 37th International Submariners' Convention which was held in St. Petersburg. The Club has established lasting friendly relationship with number of foreign submariners' and seamen's organizations, such as Naval League of the USA, ISA of GB. The Club has among it's foreign members such well-know persons as submariners Bob Long, writers Tom Clancy, Alan White, Peter Huchthausen, Roger Dunham, Jean Marie Mathey, actors Harrison Ford, Liam Nisson. The Club takes activity in the memorial programs to perpetuate the memory of the perished crewmen from K-129, K-219, K-278, K-429, K-141 "Kursk", USS Scorpion, USS Thresher and others lost submarines. To render an assistance to retired submariners and their families in the field of social support, civil adaptation and employment. The Club is public organization. It means that everybody who takes interest or concerns to the submarine service is welcome to join the Club. Among our members there are people of different professions, ages and nations.